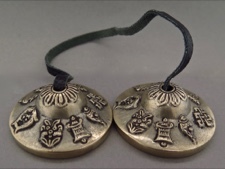 Tibetan Buddhist hand cymbals are used in prayers and rituals that are calling to awareness. 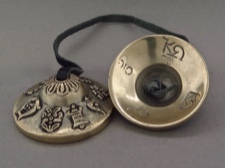 They are also known as meditation bells that can be used at any time when one wants to achieve a calm and meditative state of mind. 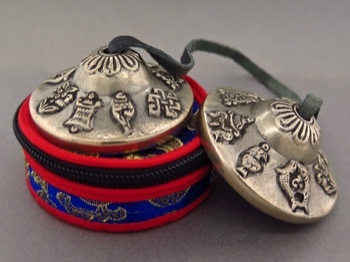 These tingshas are decorated with the 8 auspicious good luck symbols of Nepali Buddhism. They represent offerings the gods made to Buddha after his enlightenment. These bells ring clear and strong. 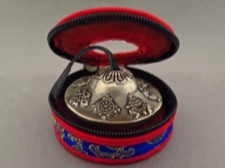 They have a 2.5 inch diameter, the connecting cord is 11 inches, and they come with a silk pouch handmade in Nepal.